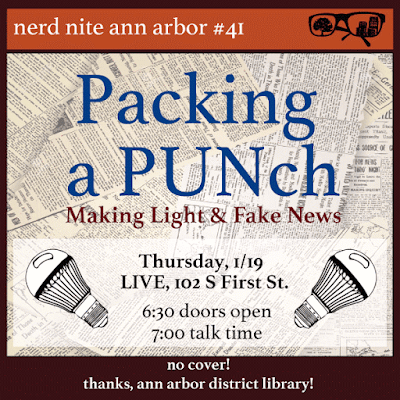 It’s the new year and we’ve got an all new line up of speakers ready to let their nerd light shine. First up is Reema Abi-Akar, who knows there’s nothing new under the pun, but has some quip-witted repartee on everyone’s (dad’s) favorite kind of wordplay. Andrew McAllister, he studies applied physics, he works on a super computer, and he predicts a glorious and well-lit future in which super-efficient LED bulbs are also super-affordable. 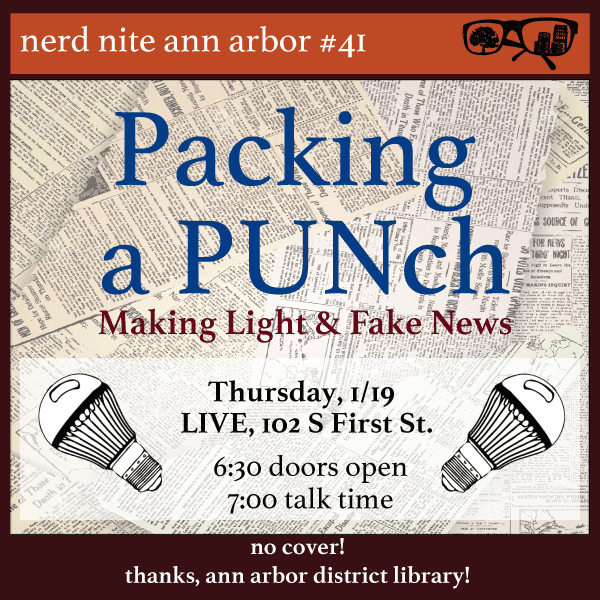 Newshound Jim McBee of The Ann magazine is here to talk about those phony news stories your uncle keeps sharing on Facebook, and how to separate the credible from the incredible. It’s going to be illuminating in more ways than pun one!